Buchanan are an alternative rock band formed in late 2009. The band is the project of English-born Josh Simons in collaboration with friends. The band are currently at work on their second studio album. The band recorded their debut record The Safety Beach E.P. in April 2010. Featuring production by Tim Cross (former Mike Oldfield collaborator) the collection of demos was released on iTunes in May 2010. The band were shortly after invited to showcase for several record labels. Deciding to steel themselves and avoid hasty commitment, the band headed back to the studio to develop more material and record the follow-up. Triple J debuted "Mr Keeperman" on Australian national radio on 19 September 2010. The band would go on to be featured on the Triple J Unearthed page and podcast. In November 2010, the band released a single called "Teachers" independently via TuneCore. The single was a Triple J hit, immediately added to high rotation and gained a five out of five star rating from Richard Kingsmill and multiple additions to The Hype Machine. In early 2011, the band played their first full electric shows in Sydney and Melbourne, playing to sold out venues with the likes of Gypsy and the Cat, Kimbra, Georgia Fair and Alpine. In February 2011 the band won the Triple J Unearthed competition and were invited to play the esteemed Laneway festival in Melbourne, playing alongside Foals, Two Door Cinema Club and Cut Copy. On 29 April 2011, the band released their first mass-produced record, No Photo - EP, to a strong critical reception. Distributed via Inertia Records, Zoo Weekly gave the release four stars, comparing the songs to "Phoenix, with the emotional gravitas of Mumford & Sons and the instrumental dexterity of Sigur Rós". MX newspaper gave the release three and a half stars describing the music as "considered indie pop". The band held residency throughout the month of release at Northcote Social Club as well as supporting Tim & Jean to promote the release. In June 2011, Buchanan embarked on their first national tour in support of second single "Mr Keeperman", playing shows in Adelaide, Sydney and Melbourne including supports with Jinja Safari, Trial Kennedy and Papa Vs Pretty. To promote the tour, the band appeared live on Triple J, Sea FM, Star FM, Joy FM, Channel 31 and on BalconyTV to perform acoustically. On 23 August 2011 the band's single "Mr Keeperman" debuted at number six on the Australian AMRAP community radio charts after being released to air as a single. In March 2012, the band released "Run Faster", a warm-up single for their forthcoming debut album, to positive critical reviews. In May 2012, the song was added to rotation on Austereo's Radar Radio. In July 2012, Buchanan won Austereo's Radar Unsigned Find competition, marking the band as the first to be recognised nationally in unsigned competitions from both Triple J and the Austereo Radio Network. In August 2012, the song was added to high rotation on Triple J. The song spent nine consecutive weeks in the AIR Charts, reaching number 3 on the 100% Independent Radio Charts and number 12 on the Independent Label Radio Charts. The song was the 99th most played song on Triple J in 2012. In October 2012, the band announced on their social media pages that they were embarking on a national tour of Australia throughout November and December. To coincide with the tour, the band offered a free download of a new B-side from their forthcoming debut album. The track, "When The Sun Comes Round Again", was made available for free from the band's official site. In April 2013, the band announced their debut studio album, Human Spring, would go on sale in Australia and New Zealand on May 10, 2013. The album, released under Simons' own label Raw Imagination People Expect, was met with extremely positive critical reviews. Tone Deaf gave the album 9/10 calling it a "tremendous debut" while Zoo Weekly gave the album an 8/10. The album was produced by Catherine Marks with additional production by frequent collaborator Tim Cross. It was recorded at various studios in Australia and the UK over the past 18 months. Andy Baldwin was hired to mix the record with the band choosing to master the album at Abbey Road with Geoff Pesche. The band released the title track, "Human Spring", on April 12 as the second single off the album. Triple J added the single to high rotation immediately. The song reached number 10 on the AIR 100% Independent Radio Charts where it spent three weeks. In June 2013, the band performed live on Triple J for Like a Version, performing a cover of Frank Ocean's "Thinkin Bout You". In July, the band released a new single from the album, "Par Avion", to coincide with a national headline tour of Australia. The band was also announced as part of the Bigsound Festival lineup for September 2013. The music video for "Par Avion" premiered on Yahoo! Music following the band's set at Bigsound. In August 2013, both the band's single and album of the same name, "Human Spring", debuted at number 10 on the FMQB Sub-modern radio charts in North America, peaking at number 8. In April 2014 the band announced the release of the album worldwide, putting out a single from the album every three weeks in the lead up to its release. "Temperamentally" hit number 30 on the iTunes US Alternative charts following the release of the single's lyric video online. The album was made available for purchase worldwide on July 9, 2014. The band are working on their second studio album with London producer Simon Duffy. They released a video on social media for a new single called "Coming Down" on July 21, 2014. The track received firm radio and club support throughout the UK and Ibiza, debuting at No. 29 on the Music Week Commercial Pop Charts. 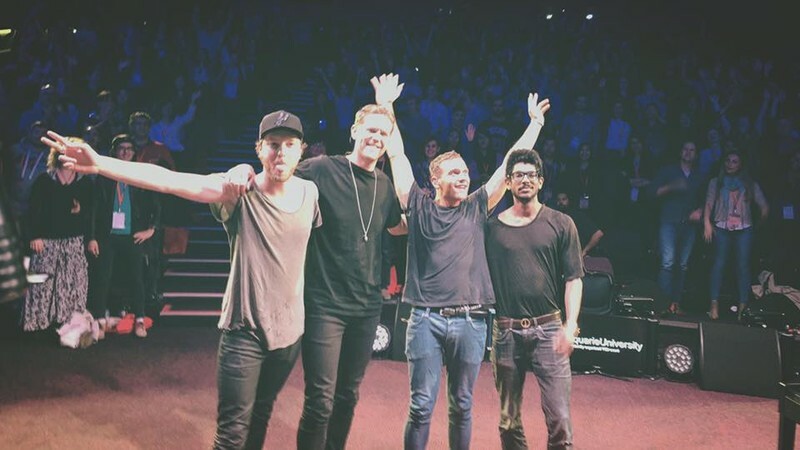 On 26 September 2015 the band headlined the TEDx Macquarie University conference, which was streamed live worldwide, debuting several tracks from the new album. On 27 October 2015 the band put up a post on social media revealing the album would be called Pressure In An Empty Space.